1. One small mesh per plant (i.e. 31/2-inch). 2. Two sawhorses (or 2 cement blocks and two 8-foot 2x4s) to support the 8 to 12-foot lengths of pipe. 3. One 1/8-inch threaded barbed fitting per plant. 4. One 1-foot piece of 1/8-inch tubing per plant. 6. Two 4-inch PVC elbow fittings. 7. One 4-inch PVC end cap per 4-inch pipe. 8. Four-inch PVC pipe cut to equal lengths (9 to 10 feet) that are used to hold the plants. 9. One T-fitting for each length of 4-inch pipe. 10. 1,200-gallon per hour (or stronger) pump. 12. 1/2-inch black poly tubing for header lines (100-foot roll). 13. Two 1/2-inch black poly elbows. 14. 1/2-inch black poly Ts (one for each pipe, minus two). 15. 1/2-inch black poly end cap for each header line. 16. One 11 to 13 PSI mister per plant. 1. Drill and 31/2-inch hole saw. B. Two (or more) sawhorses can be used to support the connected pipes. Two sawhorses support an 8 to 12-foot length of 2×4. When the sawhorses are made, the side furthest from the reservoir should be the highest, at equal height. The side nearest the reservoir should be an inch or so lower for every 8-foot length so that the solution drains back into the reservoir. 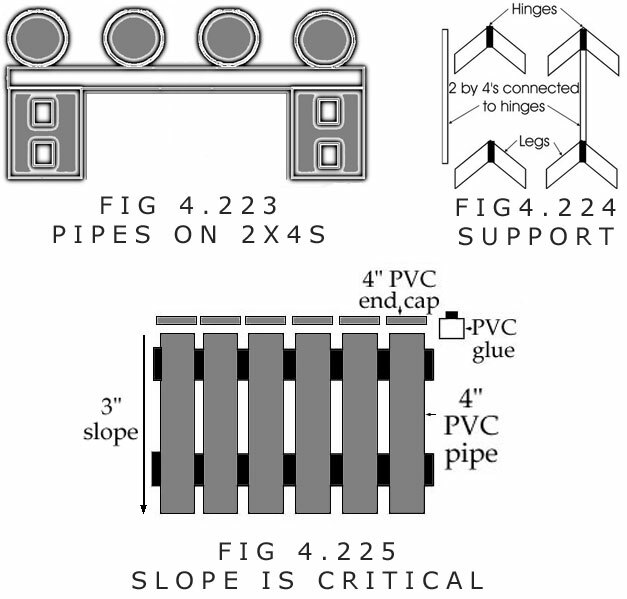 C. All piping (of 4-inch PVC) should be cut to the desired length. D. All lengths of large pipe must be have end caps attached to the higher ends (i.e. 1 inch or higher) that are located at the far side from the reservoir. E. All large 4-inch pipes (except the first and last pipe) are connected to their neighboring pipe with T-fittings. The first and last pipe are connected with 4-inch elbows. For example, 4-inch pipe will use 4-inch T-fittings. Small pieces of 4-inch pipe are placed between the T-fittings in order to connect the T-fittings and give the desired spacing (such as 10-inch centers). Piping and fittings can be glued with PVC cement (for PVC pipe), but the connections will be permanent. F. Holes of, say, 31/2 inches should be cut in the pipe at the desired spacing of 8 to 12-inch centers. The hole sizes must match the pot sizes in order to make a custom fit. 1. 1/2-inch poly tubing should be run along the outside of the pipes until it reaches the end. 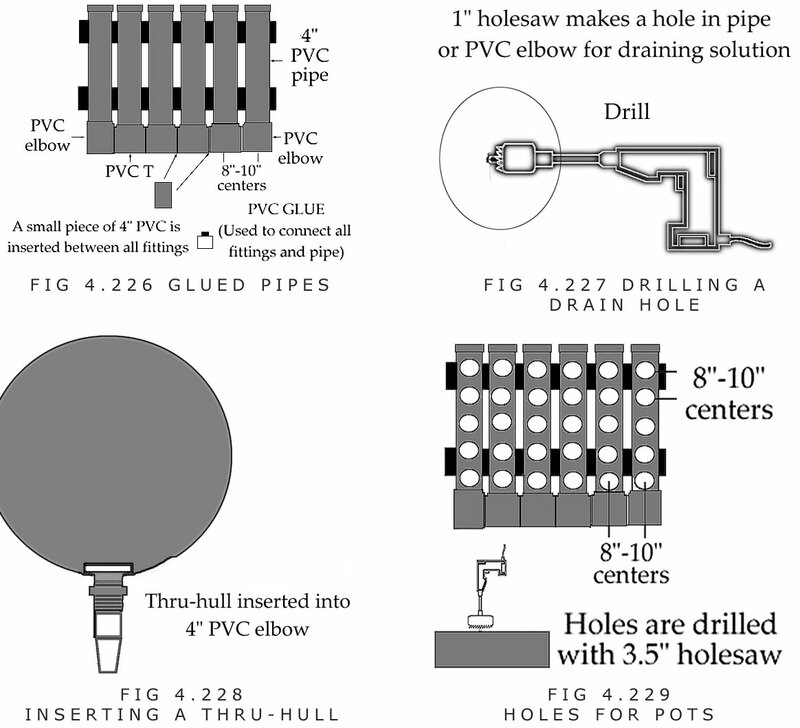 It should be cut to a length that reaches the middle of the T-fittings and elbow fitting that will be connected to the larger pipe at the shorter end. The 1/2-inch poly tubing must have a 1/2-inch end cap. H. Small holes should be punched into the 1/2-inch header line. I. Threaded fittings (i.e. 3/16, 1/8, 1/2-inch) should be inserted into each hole. J. 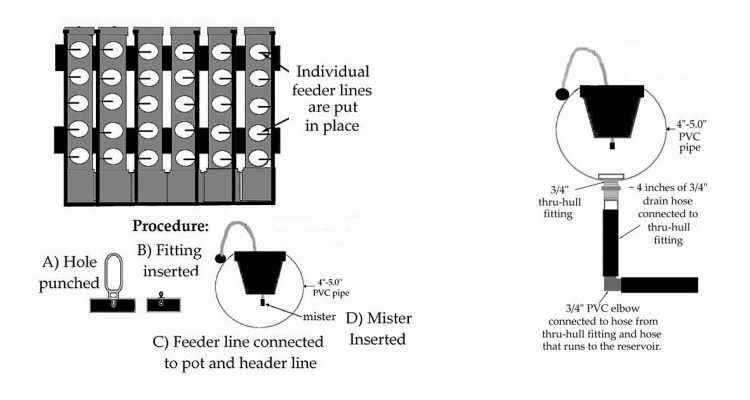 The feeder lines are connected to the fittings. The appropriate sized tubing should be connected to the fittings in the header line. For example, 3/16-inch tubing should be connected to a 3/16-inch fitting. The tubing should be cut to a length that will reach the larger hole (for the pots) with slack. K. A mister can be connected to the tubing. M. The outside of the thru-hull fitting in the 4-inch elbow can be connected to 3/4-inch hose that leads back to the reservoir. N. A 1/2-inch line runs from the pump to the header lines that run along the 4-inch pipes. A 1/2-inch PVC T is used to connect the lines together. 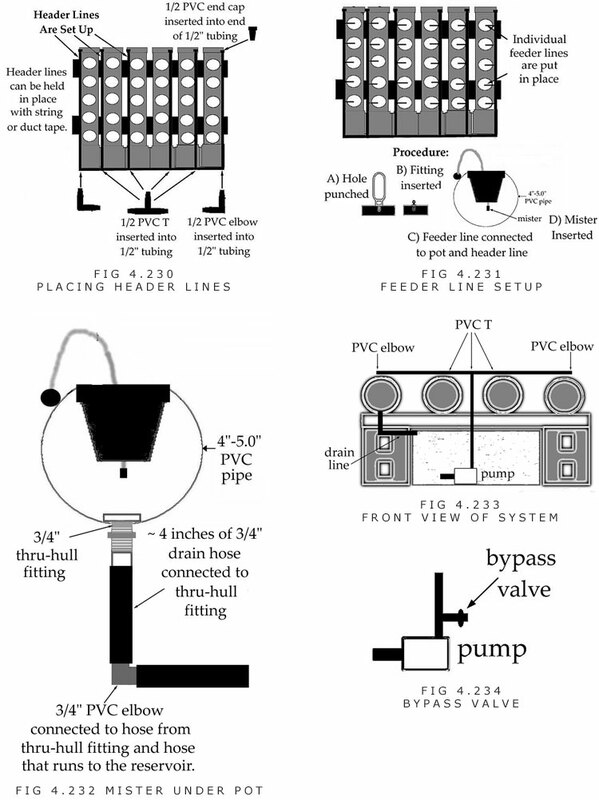 T. A bypass valve should be connected to the small piece of 1/2-inch tubing in order to control the flow rate. It is easiest to feed the plants with the pump timer running full-time, only during the light hours. But plants can be fed continuously all day and all night. Also, plants can be fed intermittently, such as every 20 minutes for two minutes during the light hours, and once in the middle of darkness. Finally, plants can be fed at the same intervals for the light and dark hours, too.